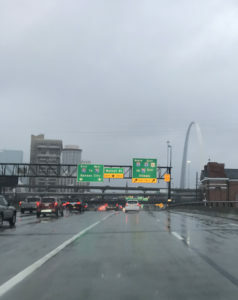 If you tuned into KMOX recently, you might have heard that when it comes to snowy conditions, St. Louis has been ranked as having the worst drivers. Dr. Alan W. Black, assistant professor in the Department of Geography, has been researching the impact of inclement weather on transportation and made an appearance on KMOX recently to comment on why this might be a special case for the St. Louis-region. Black’s research involves combining weather and crash data to assess how crash risks change during inclement weather. “Of all of cities examined, when it snows in St. Louis, they experience the greatest increase in crash rates,” said Black. He studied 13 cities in total and St. Louis was found to have the highest crash-risk in winter weather with Cincinnati coming in second. You might be wondering though why cities with greater snowfall do not have higher crash-risks and Black’s research points to some of the reasons for why that might be. “In cities like Chicago and Minneapolis, you have a lot more snow. With more snow, comes more experience. It is not just based on a single factor alone—geography plays a huge role in the experience of motorists,” commented Black. Take, for instance, the outcome of most recent winter storm in the region. “As soon as the first flake of snow fell, everyone said ‘we have to go home.’ So, everyone left at the same time and then there was a gridlock. Once the first crash happened, everyone became stuck,” explained Black. The predicament leads to further problems as snow removal crews are not able to clean the roads and emergency vehicles are unable to pass through. “It is an interesting phenomena to see here and in so many other places. With this new found information, maybe we can try to mitigate that huge rush of everyone going home all at once,” said Black. He hopes that increased awareness of the risk of driving during snow will lead to improvements in road safety. Dr. Black’s research interests lie in atmospheric hazards, climate extremes, and their impact on society. He plans to explore this phenomena further, expanding his analysis on crash-risk to include additional cities across the United States.